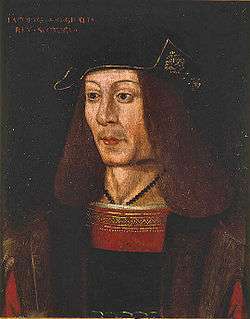 James IV (17 March 1473 – 9 September 1513) was the King of Scots from 11 June 1488 to his death. He assumed the throne following the death of his father, James III, after the Battle of Sauchieburn, a rebellion in which the younger James played an indirect role. He is generally regarded as the most successful of the Stewart monarchs of Scotland, but his reign ended with the disastrous defeat at the Battle of Flodden, where he became the last monarch not only from Scotland, but from all of Great Britain, to be killed in battle. James was the son of James III and Margaret of Denmark, probably born in Stirling Castle. As heir apparent to the Scottish crown, he became Duke of Rothesay. In 1474, his father arranged his betrothal to Princess Cecily of England. His father was not a popular king and faced two major rebellions during his reign. The marriage negotiations and dowry payments led to the invasion of Scotland and capture of Berwick in 1482 by his uncle Alexander, Duke of Albany and Richard, Duke of Gloucester while James remained at Stirling. James III's army rebelled against him and the English army reached Edinburgh. During the second rebellion, the rebels set up the 15-year-old James as their nominal leader. They fought James III at the Battle of Sauchieburn on 11 June 1488, and the king was assassinated after having left the field of battle on an out-of-control mount. The younger James took the throne and was crowned at Scone on 24 June. When he realised the indirect role which he had played in the death of his father, he decided to do penance for his sin. From that date on, he wore a heavy iron chain cilice around his waist, next to the skin, each Lent as penance, adding every year extra ounces. James IV quickly proved an effective ruler and a wise king. He defeated another rebellion in 1489, took a direct interest in the administration of justice and finally brought the Lord of the Isles under control in 1493. For a time, he supported Perkin Warbeck, pretender to the English throne, and carried out a brief invasion of England on his behalf in September 1496. Then, in August 1497, James laid siege to Norham Castle, using his grandfather's bombard Mons Meg. James recognised nonetheless that peace between Scotland and England was in the interest of both countries, and established good diplomatic relations with England, which was at that time emerging from a period of civil war. First he ratified the Treaty of Ayton in February 1498. Then, in 1502 James signed the Treaty of Perpetual Peace with Henry VII. He also maintained his relations with France. With rumours that James would renew the Auld alliance, in April 1508 Thomas Wolsey was sent to discuss Henry VII's concerns over this. Wolsey found "there was never a man worse welcome into Scotland than I, ... they keep their matters so secret here that the wives in the market know every cause of my coming." James saw the importance of building a fleet that could provide Scotland with a strong maritime presence. James founded two new dockyards for this purpose and acquired a total of 38 ships for the Royal Scots Navy, including the Margaret, and the carrack Michael or Great Michael. The latter, built at great expense at Newhaven and launched in 1511, was 240 feet (73 m) in length, weighed 1,000 tons and was, at that time, the largest ship in the world. James IV was a true Renaissance prince with an interest in practical and scientific matters. He granted the Incorporation of Surgeons and Barbers of Edinburgh (later the Royal College of Surgeons of Edinburgh) a royal charter in 1506, turned Edinburgh Castle into one of Scotland's foremost gun foundries, and welcomed the establishment of Scotland's first printing press in 1507. 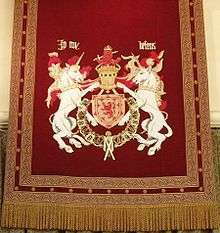 He built a part of Falkland Palace, and Great Halls at Stirling and Edinburgh castles, and furnished his palaces with tapestries. James was a patron of the arts, including many literary figures, most notably the Scots makars whose diverse and socially observant works convey a vibrant and memorable picture of cultural life and intellectual concerns of the period. Figures associated with his court include William Dunbar, Walter Kennedy and Gavin Douglas, who made the first complete translation of Virgil's Aeneid in northern Europe. His reign also saw the passing of the makar Robert Henryson. He patronised music at Restalrig using rental money from the King's Wark. 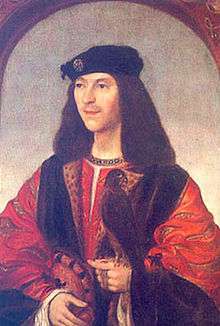 James IV was the last King of Scots known to have spoken Scottish Gaelic. James is one of the rulers reported to have conducted a language deprivation experiment, sending two children to be raised by a mute woman alone on the island of Inchkeith, to determine if language was learned or innate. At Stirling Castle, James established an alchemy workshop where alchemist John Damian looked for ways to turn base metals into gold. The project consumed quantities of mercury, golden litharge, and tin. Damian also researched aviation and undertook a failed experiment to fly from the battlements of Stirling Castle. After this defiance, Alexander Gordon, 3rd Earl of Huntly, was granted Torquil's lands. He raised an army in Lochaber and also cleared the tenants of that area, replacing them with his supporters. After the parliament of 1504, a royal fleet sailed north from Ayr to attack the Castle of Cairn-na-Burgh, west of Mull, where, it is thought, Maclean of Duart had Donald Dubh in his keeping. As progress at the siege was slow, James sent Hans the royal gunner in Robert Barton's ship and then the Earl of Arran with provisions and more artillery. Cairn-na-Burgh was captured by June 1504 but Donald Dubh remained at liberty. In September 1507, Torquil MacLeod was besieged at Stornoway Castle on Lewis. Donald Dubh was captured and imprisoned for the rest of his life, and Torquil MacLeod died in exile in 1511. The Earl of Huntly was richly rewarded for his troubles, a price that James was prepared to pay. When war broke out between England and France as a result of the Italian Wars, James found himself in a difficult position as an ally by treaty to both France and England. Henry VIII of England invaded France, and James reacted by declaring war on England. James had already balked at the interdict of his kingdom by Pope Julius II, and he opposed its confirmation by Pope Leo X, so he was not in a good position with the pontiff. Leo sent a letter to James, threatening him with ecclesiastical censure for breaking peace treaties, on 28 June 1513, and James subsequently was excommunicated by Cardinal Christopher Bainbridge. James summoned sailors and sent the Scottish navy, including the Great Michael, to join the ships of Louis XII of France, so joining in the war of the League of Cambrai. Hoping to take advantage of Henry's absence at the siege of Thérouanne, he led an invading army southward into Northumbria, only to be killed, with many of his nobles and common soldiers, at the disastrous Battle of Flodden on 9 September 1513. A body, thought to be that of James, was recovered from the battlefield and taken to London for burial. James had been excommunicated, and although Henry VIII had obtained a breve from the Pope on 29 November 1513 to have the King buried in consecrated ground at St. Paul's, the embalmed body lay unburied for many years at Sheen Priory in Surrey. The body was lost after the Reformation, which led to the demolition of the priory. John Stow claimed to have seen it, and said the king's head (with red hair) was removed by a glazier and eventually buried at St Michael Wood Street. The church was later demolished and the site redeveloped many times; it is now occupied by a pub. James's bloodstained coat was sent to Henry VIII (then on campaign in France) by his queen, Catherine of Aragon. Erasmus provided an epitaph for the King in his Adagia. Later, in 1533, he wrote to James V of Scotland pointing out this essay on duty under the adage Spartam nactus es, (You who were born to Sparta shall serve her), on the subject of the Flodden campaign and the death of James and his son Alexander. However rumours persisted for many years that James had survived and had gone into exile, or his body was buried in Scotland, with no evidence to support them. 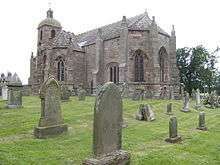 Two castles in the Scottish Borders are claimed to be the resting place of James. These stories follow the legend that, prior to the Scots charge at Flodden, James had ripped off his royal surcoat to show his nobles that he was prepared to fight as an ordinary man at arms. What was reputed to be James IV's body recovered by the English did not have the iron chain round its waist. (Some historians claimed he removed his chain while "dallying" in Lady Heron's bedroom.) However, Border legend claimed that during the Battle of Flodden four Home horsemen or supernatural riders swept across the field snatching up the King's body as such a prize could not be allowed to fall into English hands after such a humiliating defeat, or that the King left the field alive and was killed soon afterwards. In the 18th century when the medieval well of Hume Castle was being cleared, the skeleton of a man with a chain round his waist was discovered in a side cave; but this skeleton has since disappeared. Another version of this tale has the skeleton discovered at Hume a few years after the battle and re-interred at Holyrood Abbey. Exactly the same story was told for Roxburgh Castle, the skeleton there discovered in the 17th century. Yet another tradition is the discovery of the royal body at Berry Moss, near Kelso. Fuelling these legends, Robert Lindsay of Pitscottie, writing in the 1570s, claimed that a convicted criminal offered to show Regent Albany the King's grave ten years after the battle, but Albany refused. His early betrothal to Cecily of England came to nothing, but interest in an English marriage remained. A stillborn daughter at Holyrood Palace on 15 July 1508. James V (Linlithgow Palace, 10 April 1512 – Falkland Palace, Fife, 14 December 1542), the only one to reach adulthood, and the successor of his father. A second stillborn daughter at Holyrood Palace in November 1512. Catherine Stewart(c. 1495 – 1554), who married James Douglas, 3rd Earl of Morton. Margaret Stewart (born around 1497), married first John Gordon, Lord Gordon and second Sir John Drummond. The Arrow of the North (1906) by R. H. Forster. The novel mainly depicts Northumberland in the reigns of Henry VII and Henry VIII of England. It covers the Flodden campaign of the Anglo-Scottish Wars and the finale depicts the battle which ended James IV's life. The Tournament of the Black Lady is a short story which features the 1508 jousting tournament held by King James at Edinburgh Castle. The Tournament of the African Lady is a short animation that recreates the jousting tournament held by King James IV of Scotland on the 31st May 1508. ↑ Goodwin, George. Fatal Rivalry: Flodden 1513. New York: WW Norton, 2013. pp. 9-10. ↑ Macdougall, Norman, James IV, (1997), p.254: Letters James IV, SHS (1953) p.xlii, 107-111: Pinkerton, John, History of Scotland from the Accession, vol.2 (1797), p.449, prints Wolsey's letter in full and attributes it to Nicolas West. ↑ "First Language Acquisition". Western Washington University. Retrieved 3 February 2007. 1 2 Dr. Tony Pollard (8 September 2013). "The sad tale of James IV's body". BBC News Scotland. Retrieved 9 September 2013. ↑ Marek, Miroslav. "Complete Genealogy of the House of Stuart". Genealogy.EU. 1 2 3 4 Nield (1968), p. 61. 1 2 3 Nield (1968), p. 67.